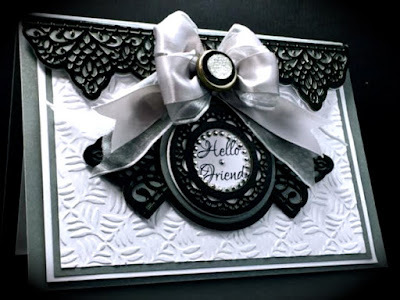 Cards by America: Hello Friend! This card is featuring the Creative Expressions Australian Collection Melbourne, and the Corner, Border and Tag Dies by Sue Wilson. It's my dramatic make in black and white for this week's CEDT post. I've also used CE's Leafy Quad Embossing Folder, CE's Dazzlers and CE Cosmic Shimmer Acrylic Glue. Cuts are layered for depth. Topped it all off with rhinestones and double-tied ribbons. Accessories: Creative Memories Circle Paper Punches, Silver Circle Pearls by Recollections, Creative Expressions Dazzlers, Creative Expressions Leafy Quad Embossing Folder, CE Cosmic Shimmer Glue and Creative Expressions Craft Dies by Sue Wilson; Australian Collection Melboure Set and the Corner, Border and Tag Dies. Very nice, I really like black and white. Hi America, this is a gorgeous card. Black and white are always so classy. Very chic in black and white! And love these diecuts!